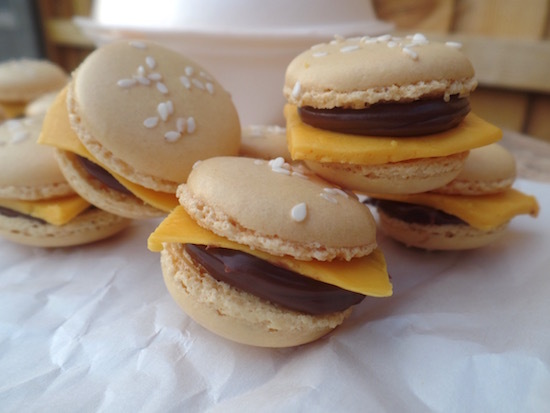 Emily's Recipes and Reviews | UK Food Blog | Leicestershire : cheeseburger macarons. Miniature burgers, but not as you know it. These tiny bites aren't made of Aberdeen Angus and plastic cheese I'm afraid, but instead Nutella and a slice of cleverly coloured chocolate. With my trusty basic macaron recipe by my side, I thought I'd go all topsy turvy with a hamburger macaron recipe. 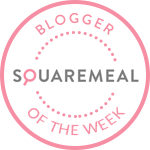 Although I didn't add any greenery to the recipe (so it isn't your five a day I'm afraid...) so I guess it's a cheeseburger macaron recipe - easy on the salad! ♥ Brown, or orange food colouring. Begin by following the macaron tutorial, with a light brown, or orange/yellow food gel. I used the tiniest drop of Sugarflair's "Autumn Leaf" to create a light burger bap shade. Step one. When you've piped the macarons, scatter sesame seeds on top whilst the shells form and dry. This will take at least 15 minutes until they are dry to the touch. Step two. Bake for 15 minutes, only checking the oven at 10. Allow to completely cool before removing from the tray. Step three. In this time, prepare your "fake cheese" chocolatey goodness. I bought some yellow coloured Belgian chocolate from eBay which turned out to be the perfectly awful cheese single shade. Step four. Roll out the chocolate between cling film or a sandwich bag, cut into small squares and keep in the fridge until ready. Step five. Fill a piping bag with Nutella, or hazelnut chocolate spread. Pipe evenly onto the macaron shells. Step six. Complete the burger with a slice of "cheese" and the other half of the bun. Sorry no five a day here! And enjoy your little burger macaron bite! Have you ever tried cheeseburger or hamburger macarons? Or perhaps have any ideas of alternative macaron recipes? Happy 4th of July to my American friends! 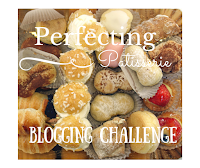 I've added this recipe to the Perfect Patisserie link up from Baking Queen 74. These are so cute and it's such an original idea! I need to make these for an upcoming party I'm hosting.Thanks for sharing! These are so clever, love the cheeseburger idea! so cute! great idea. love to have a go at making these! I see your macaroon making has reached peak potential! They all look amazing and you've obviously mastered the macroon. These are a great idea and really cute! These look brilliant Emily. Thanks for adding them to my Pinterest groupboard. I love how cute they are! I love the idea of a hamburger macaron - so cute! Great for a party too. Thanks for your lovely entry into #PerfectingPatisserie! Wow! What a cute idea and such perfect macarons. Macarons are my current baking nemesis (they just won't turn out right) so perhaps I should give your trusty recipe a try.